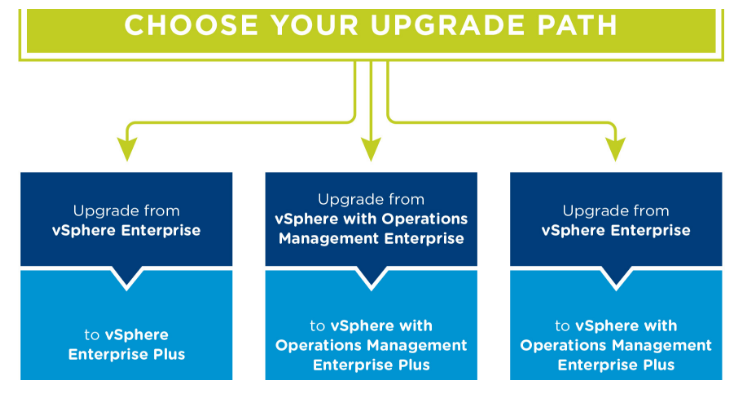 Upgrade to vSphere Enterprise Plus for 50% Off! As a result of VMware's recent licensing changes, the Enterprise edition of vSphere has reached end of life as of June 30th, 2017. Piggy backing off VMware’s promotion, Vista IT Group is offering a 50% discount when you upgrade from vSphere Enterprise to vSphere Enterprise Plus (with or without Operations Management). This offer is also available when upgrading from vSphere with Operations Management Standard to vSphere with Operations Management Enterprise Plus. Upgrade now and gain advanced features to boost your environment, such as: Distributed Switch, Storage DRS, I/O Controls (Network and Storage), Host Profiles, Auto Deploy, vFlash, and Cross-vCenter/Long Distance vMotion. This promotion is available now through Feb 3, 2018 - don't miss out on your opportunity to take advantage of this special pricing on the leading virtualization platform available in the market today!